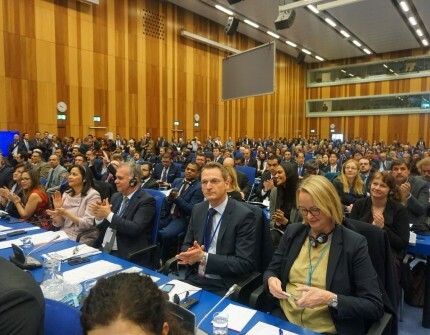 On March 14-15, 2019, delegation of Turkmenistan took part in the work of the 62nd regular session of the United Nations Commission on Narcotic Drugs (CND) in Vienna, Austria. The main topic of the Commission’s agenda was the fight against illicit trafficking in narcotic drugs and their precursors. The participants of the session paid attention to the issues of further strengthening the international drug control system (ISCO), compliance with the UN anti-drug conventions, and objectives of solving the drug problem on the basis of an integrated approach. The delegation of Turkmenistan informed the conference participants about the state policy in the field of countering the trafficking of drugs, psychotropic substances and precursors. The active interaction between Turkmenistan and the United Nations Office on Drugs and Crime, the Central Asian Regional Information Coordination Centre and the International Narcotics Control Board in the framework of regional and national drug control programs was noted in the statement. According to the results of the Forum, which gathered delegations from more than 100 countries of the world, a Declaration determining the main directions of international cooperation in the fight against this global problem has been adopted. The document notes the need to consolidate the efforts of the world community, develop social and medical programs, and further strengthen the Commission on Narcotic Drugs as the main UN decision-making body in the anti-drug activities. The work of the above-mentioned event will continue until March 22 of this year, in the framework of the regular session, which envisages a number of events and round tables.